Mixed Martial Arts (MMA) incorporates the most effective elements of grappling and striking to form what is a complete combat sport, and the current fastest growing sport in the world. Combining techniques from martial arts including Boxing, Kickboxing and Brazilian Jiu-Jitsu (BJJ), this reinvention of multiple disciplines is commonly known as the fighting style of the Ultimate Fighting Championships (UFC). 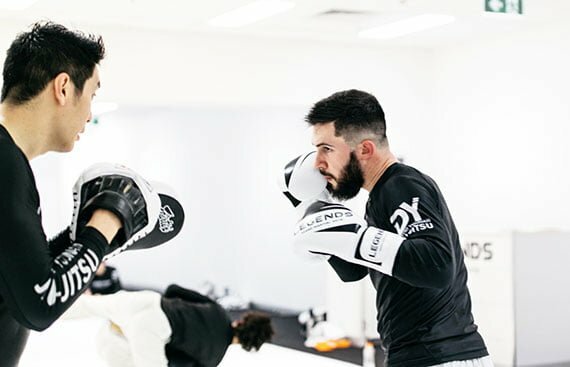 Our MMA classes, centrally located in our Melbourne CBD gym, are safe and suitable for all MMA experience levels from beginners to competitors. Our trainer Chris McMullan was first introduced to Martial Arts at a young age through the martial art of Karate. It was in his teenage years in Ireland that he discovered boxing as a sport and trained with many of the All Ireland Champions. Inspired by Bruce Lee, and recognising his ability to use other elements including kicks from his earlier Karate training, Chris began training in mixed martial arts including various arts of grappling and Muay Thai. We have developed a world class MMA curriculum covering Striking (boxing and kickboxing) and Grappling (takedowns, wrestling and submissions) on a daily basis. Our Mixed Martial Arts classes start with some solo stretching, shadow boxing and bag work. After your solo warm-up, the trainer will take you through a series of MMA moves that you will do whilst jogging around the gym or on the spot. This part of the class is the perfect start for a beginner learning the basics of Mixed Martial Arts. You’ll then get the opportunity to learn a technique which our trainer will demonstrate, whether it be grappling, kicking, punching or a combination of moves. You will practice and improve this technique with a partner, alternating who is holding the pads if necessary. You’ll also have the opportunity to swap partners, to provide diverse experience for the specific technical skill. A second technical session will then commence which will consist of either a continuation of the initial technical skills session, with a further move or moves added forming a new combo or a different technique all together. Your final part of the session will be an intense, fast paced workout period, where you can put your skills to the test and improve your strength, technique and cardiovascular fitness. After the session you may have the chance to lightly spar with other students under strict supervision and only if you are comfortable to do so. As with all sessions at Legends MMA, our family is important to us, so we will end the session with a handshake between all students and team members! Is Mixed Martial Arts safe for beginners? If this is your first time training in Mixed Martial Arts (MMA) then don’t worry, at Legends MMA one of the first things you will notice when you step into the gym is the friendly vibes! We have beginners come through every day, so you are not alone! The most important thing is to just be good to yourself and make a commitment to attend your first class and have fun. Once you start training you’ll be amazed at what you can do! Do I need to be strong, flexible, and in good shape before starting? No – You do not need to be strong, flexible, or in particularly good shape before you start training in Mixed Martial Arts (MMA). However, after you start training in MMA consistently you will get in the best shape of your life! What type of people do Mixed Martial Arts? 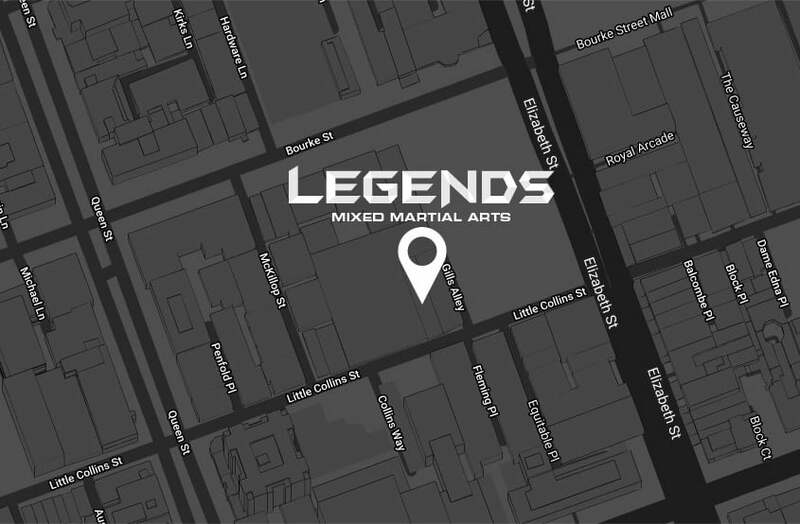 Mixed Martial Arts (MMA) at Legends MMA is for everyone – regardless of age, gender and fitness levels. MMA is a magnet for interesting people. At Legends MMA we have professional athletes, doctors, lawyers, builders, students, finance professionals, marketing executives…the list goes on! MMA attracts a diverse range of people and so many fascinating minds, it will be impossible to not form some great friendships. What are the health benefits of Mixed Martial Arts? Mixed Martial Arts (MMA) is the fastest growing sport in the world…and it’s not because of people taking it up competitively, but because of people taking it up as a way to exercise and keep fit whilst learning a real practical skill as a means for self-defense. Given the cardio intense and agile nature of MMA workouts, you will get fitter, faster, stronger and more flexible in a short amount of time. MMA classes include stretching, shadow boxing and bag work, jogging and techniques drills involving a combination of grappling and striking elements. All of this results in an intense, fast paced workout period, where you can put your skills to the test and improve your strength, technique and cardiovascular fitness. How should I prepare for my first class and what should I wear? You don’t need any special preparation before your first class. Just wear comfortable workout clothes (t-shirt and shorts) and bring a powerful attitude so you are ready to learn and have fun! Ready to start? 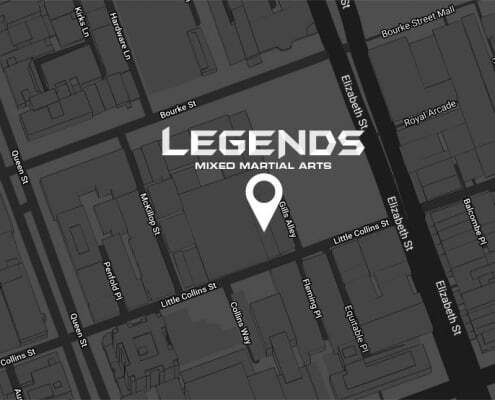 Claim your FREE first session at Legends MMA! Your first session is FREE at Legends MMA, complete the form below to book in your first class now with no commitment!